The paper discusses temporal changes in the configuration of vertical climatic belts in the Tatra Mountains as a result of current climate change. Meteorological stations are scarce in the Tatra Mountains; therefore, we modelled decadal air temperatures using existing data from 20 meteorological stations and the relationship between air temperature and altitude. Air temperature was modelled separately for northern and southern slopes and for convex and concave landforms. Decadal air temperatures were additionally used to delineate five climatic belts previously distinguished by Hess on the basis of threshold values of annual air temperature. The spatial extent and location of the borderline isotherms of 6, 4, 2, 0, and − 2 °C for four decades, including 1951–1960, 1981–1990, 1991–2000, and 2001–2010, were compared. Significant warming in the Tatra Mountains, uniform in the vertical profile, started at the beginning of the 1980s and led to clear changes in the extent and location of the vertical climatic belts delineated on the basis of annual air temperature. The uphill shift of the borderline isotherms was more prominent on southern than on northern slopes. The highest rate of changes in the extent of the climatic belts was found above the isotherm of 0 °C (moderately cold and cold belts). The cold belt dramatically diminished in extent over the research period. Similar to latitudinal climatic zones, but distributed within short distances, vertical climatic belts (altitudinal zonation) constitute the most prominent feature of mountain areas from the viewpoint of climate studies (Beniston et al. 1997). Altitudinal zonation results from rapid changes in air temperature with increasing altitude, which impacts vegetation (Hess 1965; Niedźwiedź 1992) and many environmental processes (Beniston et al. 1997). Current climate change, identified as enormously accelerating global and regional warming (IPCC 2013) which is proceeding particularly rapidly in European mountains (EEA 2009), may also manifest itself as a change in the configuration of altitudinal zonation. However, research on climate change and its impacts in mountainous areas is a challenging task, due to a scarcity of meteorological stations with long-term records of climate elements and to very complicated relief, which creates a mosaic of various microclimates. This also concerns the Tatra Mountains, the highest mountain range in Poland, which is characterised by very complicated relief which strongly influences air temperature distribution and other climate characteristics (Kożuchowski 1996). For example, the mean annual air temperature on the northern slopes ranges from about 5.8 °C at altitudes of 600–650 m a.s.l. to − 3.7 °C at high elevations (Lomnicky štit, 2633 m a.s.l.) (Hess 1965; Konček 1974; Niedźwiedź 1992; Niedźwiedź et al. 2015). Studies on climate change in the Tatra Mountains are rare and usually based on data from only two meteorological stations, one located in the foothills of the Tatras in Zakopiańska Hollow (Zakopane station, 844 m a.s.l.) and the other on the peak of Kasprowy Wierch (1991 m a.s.l.). Increasing trends in annual and seasonal air temperature over the period 1951–2006 were identified at both stations (Żmudzka 2011). Progressive warming, particularly in the higher part of the Tatras, also took place between 1966 and 2006. Although insignificant, the rate of change in the annual air temperature on Kasprowy Wierch increased from 0.1 K per 10 years in 1951–2006 to 0.2 K per 10 years in 1966–2006 (Żmudzka 2009). The trends for the periods updated to 2015 and 2016 were more rapid, reaching 0.2 K per 10 years for the period 1951–2015 (Łupikasza et al. 2016) and 0.3 K per 10 years for 1966–2016 (statistically significant at α ≤ 0.001, according to the present study). As the rate of warming at many high elevated sites is greater than the rate of global change, the impact of future climatic change may be stronger at high elevations (Beniston et al. 1997). Clear linear relationships between relief (altitude, aspect, and landform) and average annual air temperatures in the Tatra Mountains were recognised and quantified by Hess (1965, 1966, 1968, 1974) and then used to demarcate five vertical climatic belts. This paper discusses the changes in location and extent of the altitudinal climatic belts in the Tatra Mountains in selected decades between 1951 and 2010. The paper consists of six sections, the second of which presents the study area and the classification of vertical climatic belts by Hess (1965, 1968). The data and methods used in the study are presented in Section 3. Because the configuration of vertical climatic belts depends on air temperature, Section 4 concerns temporal changes in decadal air temperature and constitutes a background for further analysis of changes in altitudinal zonation. The subsequent section, Section 5, includes an assessment of the relationship between annual air temperature and altitude, carried out separately for northern and southern slopes, for concave and convex landforms, and for each of four decades. This enabled us to create linear regression equations enabling calculation of the annual air temperature at any point in the vertical profile of the Tatra Mountains. Section 6 presents temporal changes in the location and extent of the vertical climatic belts; Section 7 includes a discussion of the possible consequences of shifts in altitudinal zonation; and Section 8 contains the conclusions. Located in Central Europe (49° N, 20° E) on the border of Poland and Slovakia (Fig. 1), the Tatra Mountains are the highest and the most rugged range of the Carpathians, occupying an area of 785 km2. The mean altitude is 1492 m a.s.l. and the highest peak, Gerlach, is 2655 m a.s.l. The typical alpine landscape of the Tatra Mountains, surrounded by wide basins, results in the most diversified climatic conditions in Central Europe. The complicated topography strongly influences the spatial and particularly the vertical distribution of air temperature, as is accurately reflected in clearly shaped vegetation belts (Hess 1965, 1968; Hess et al. 1975; Niedźwiedź 1992). Using average annual air temperature, Hess (1965, 1966, 1968) distinguished five vertical climatic belts, each representing a range of 2 °C; their borders are delineated by threshold isotherms of + 6, + 4, + 2, 0, and < − 2 °C, close to the highest peaks of the Tatra Mountains. Details concerning the vertical climatic belts in the Tatra Mountains are included in Table 1 and Fig. 2. Threshold isotherms are important for the environment. The − 2 °C isotherm determines the climatic snow line, while that of 0 °C coincides with the upper limit of the subalpine belt. The upper timberline is delineated by an annual air temperature of + 2 °C and is equivalent to the location of the June isotherm of + 10 °C. The upper limit of mixed forest and agriculture is related to the annual + 4 °C isotherm. Study area and location of meteorological stations in the Tatra Mountains, below, the station altitudes are given in the brackets: 1—Červený Kláštor (465 m), 2—Maniowy (520 m), 3—Liptovský Mikuláš (567 m), 4—Ústie n. priehradou (598 m), 5—Liptovský Hrádok (648 m), 6—Poprad-Tatry (694 m), 7—Stará Lesná (807 m), 8—Tatranská Lomnica (827 m), 9—Witów (835 m), 10—Podbanské (972 m), 11—Tatranská Javorina (1030 m), 12—Hala Ornak (1109), 13—Polana Chochołowska (1145 m), 14—Štrbské Pleso (1354 m), 15—Morskie Oko (1400), 16—Hala Gąsienicowa (1523 m), 17—Dolina 5 Stawów (1674 m), 18—Skalnaté Pleso (1778 m), 19—Kasprowy Wierch (1991 m), and 20—Lomnicky Štit (2635 m). Hess (1965, 1968) also found that altitude is the most prominent factor determining vertical changes in annual air temperature. Strong linear regression between these variables enables calculation of the annual air temperature at any point in the vertical profile of the Tatra Mountains. Hess (1965, 1968) constructed separate linear regression models for concave and convex landforms and for northern and southern slopes. These features (landforms and aspects) were recognised as additional factors influencing air temperature distribution. Hess (1965, 1974) observed that at the same elevations, concave forms (valleys, basin floors) and northern slopes are about 1 °C colder than convex forms (ridges, peaks) and southern slopes. Since vertical climatic belts are related to annual air temperature, climate changes will cause changes in their location (Kożuchowski 1996) and, probably, their extent. Based on an assumed increase of 2 K in the July air temperature (Olecka 1993), changes of ca 300 m in the locations of particular vertical climatic zones (between 300 and 360 m, depending on zone) were assessed. The disappearance of the highest—the cold zone—is expected by the end of the twenty-first century (Kożuchowski 1996). Therefore, analysis of the current changes in altitudinal zonation is relevant and interesting. We used available climatological data on annual air temperature from 20 meteorological stations located in various parts of the Tatra Mountains and their surroundings (Fig. 1). The data represents four decades, including 1951–1960 and, subsequently, 1981–1990, 1991–2000, and the warmest period, 2001–2010, thus reflecting climate change in the study area. Data for decades between 1961 and 1980 were not available for us. We also used annual air temperatures for the period 1951–2016 from two synoptic stations which are still operating at present in Zakopane and on the peak of Kasprowy Wierch in order to discuss long-term changes in air temperature in the Tatra Mountains. The data was taken from the Meteorological Yearbooks published by the Institute of Meteorology and Water Management (IMGW 1959-1965) and from the OGIMET database (Valor 2017). The station data and the Hess method (1968) were used to reconstruct linear regression equations separately for four decades (1951–1960, 1981–1990, 1991–2000, 2001–2010), which were used in turn to calculate mean annual air temperatures at each of a dense set of points representing the diversity of the topography of the Tatra Mountains (Fig. 1). The modelled decadal air temperature data was additionally used to identify the location of the vertical climatic belts and to assess their temporal changes. To obtain denser information on decadal air temperature, we generated a regular network of points (500 m × 500 m) covering the research area. Then, on the basis of a digital elevation model (DEM) (NMT 2014), we selected 1896 points with clear southern (azimuth 135°–225°) or northern (azimuth 315°–360° and 0°–45°) aspects, located within clearly shaped concave (valleys, basins, topographic lows) or convex (ridges, peaks, crests) landforms (Fig. 3). The average density of the selected points is 1.1 pts. per km2 for the entire study area and 1.8 pts. per km2 for the Tatra Mountains. The DEM covers about 1712 km2 (Fig. 1). Where necessary, the network was modified by adding new points or by relocating the existing points to represent a characteristic feature of the topography. ArcGIS software (Esri 2016) was used for interpolation and planimetric calculations. Mean absolute error (MAE) and root mean square error (RMSE) were used to assess the accuracy of the linear regression models for mean annual air temperature, with altitude as a predictor. MAE, which measures the average magnitude of errors in a set of predictions without considering their direction, is the average of the absolute differences between a prediction (ŷi) and actual observation (yi) at n stations, where all individual differences have equal weight (Eq. 1). RMSE, a quadratic scoring rule that also measures the average magnitude of error, is the square root of the average of squared differences between a prediction (ŷi) and actual observation (yi) (Eq. 2) at n stations. RMSE is always larger than or equal to MAE. The greater the difference between errors, the greater the variability in individual errors in the sample. Annual air temperature was recognised as a complex characteristic of the thermal conditions responsible for, inter alia, the distribution of vertical climatic belts (Hess 1965). Therefore, we begin by presenting decadal changes in annual air temperature using data from 15 meteorological stations for each of the four decades being considered. Detailed changes are reviewed based on data covering the period 1951–2016 from two synoptic stations operating currently in the foothills of the Tatra Mountains (Zakopane, 857 m a.s.l.) and on the peak of Kasprowy Wierch (high mountain station, 1991 m a.s.l.). The locations of four of the stations (Štrbské Pleso, Liptovský Mikuláš, Tatranská Lomnica, and Tatranská Javorina) were shifted during the research period but revision of metadata and personal information from the Slovak Hydrometeorological Institute indicated no serious inhomogeneity in decadal averages of annual air temperature. The average annual air temperature calculated from decadal averages varied from 7.1 °C (Liptovský Mikuláš, 567 m) to − 3.5 °C (Lomnicky štit, 2635 m). At most of the stations, the first decade (1951–1960) was the coolest, but at every station, the highest annual temperatures were those for the last decade, which indicates gradual warming (Fig. 4). The difference in average air temperature between 1951–1960 and 2001–2010 ranged from 0.2 to 1.2 K, depending on the station. Both the smallest and the largest differences were associated with altitudes up to ca 1450 m a.s.l. Above 1500 m a.s.l., the rate of warming varied between 0.8 and 1.1 K. Non-gradual changes in air temperature at some stations show that decadal time resolution may still reflect variability and, in some cases, might involve too brief a period to visualise general trends in climate elements (Fig. 4). The horizontal dashed line in Fig. 4 (left-hand graph) represents the boundaries between vertical climatic belts in the Tatra Mountains (from + 6 °C to < − 2 °C). At some stations located in the vicinity of the boundaries, air temperatures crossed the threshold values, which is evidence for potential shifts in the locations of the vertical climatic belts. Linear trends calculated for the entire research period indicate statistically significant warming at a rate of 0.3 K per decade in Zakopane and 0.2 K per decade on Kasprowy Wierch. In fact, two periods with different trend magnitudes (Zakopane) or directions (Kasprowy Wierch), from 1951 to 1980 and from 1980 to 2016, are distinctly visible within the long-term course of annual air temperature (Fig. 5). In the 30-year period between 1951 and 1980, Zakopane saw mainly fluctuations with no trends, while Kasprowy Wierch experienced decreases, though insignificant, in annual air temperature at the rate of − 0.1 K per decade. These differences in the course of air temperature at the stations might have been related to highest frequency of cyclonic weather between 1965 and 1980 which possibly influenced air temperature in the highest parts of the Tatra Mountains. Urbanisation in the city of Zakopane was also supposed to play some role; however, this needs further research. Thus, the earliest of the analysed decades (1951–1960) represents a period of relatively stable thermal conditions. Rapid warming of a rate of 0.55 °C per decade in the Tatra Mountains began at the beginning of the 1980s and has continued to date. Crucial changes with respect to vertical climatic belts in Zakopane and Kasprowy Wierch may have taken place between 1990 and 2005. Prior to 1990, the average annual air temperature barely exceeded + 6 °C in Zakopane and 0 °C on Kasprowy Wierch. After 2005, the only annual air temperatures below + 6 °C or 0 °C, respectively, occurred in 2010. At both stations, the lowest annual air temperature occurred in 1956 (Kasprowy Wierch − 2.2 °C, Zakopane + 3.5 °C), the highest in 2014 (Kasprowy Wierch + 1.3 °C, Zakopane + 7.2 °C). The range of variability reached 3.5 °C at Kasprowy Wierch and 3.7 °C at Zakopane. The distribution of vertical climatic belts for the last of the analysed decades results from current climate change. This pattern of changes might be representative of the greater part of the Tatra Mountains area, as the long-term series of air temperature are significantly correlated between one station and another. Most of the correlation coefficients calculated for the period 1981–2010 exceeded 0.8 (not shown). However, some local differences are possible, due to the great variability of local environmental conditions which may blur general trends. For example, at the Kasprowy Wierch station, the period between ca 1975 and 1978 was cooler than previous years, which was not the case in Zakopane. Local variations in the course of annual temperature are evidenced by the non-gradual course of decadal averages at some stations including Tatranská Lomnica, Hala Ornak, Štrbské Pleso, and Dolina Pięciu Stawów, where the averages for 1991–2000 were lower than for the 1981–1990 period (Fig. 4). Although the location of Štrbské Pleso station has been shifted during the research period (from 1330 to 1353 m of altitude in 1961, by 1 m higher in 1992 and from 1354 to 1322 m of altitude in 2005), any inhomogeneity was recognised in 10-year means of annual air temperature (personal information for Pavel Šťastnỳ, the Slovak Hydrometeorological Institute). Therefore, it is reasonable to assume that the relocation of Tatranská Lomnica station by only 7 m of altitude in 1993 also did not significantly influence decadal annual air temperature. Unfortunately, the number of stations operating within the Tatra Mountains has decreased since Hess’s day; therefore, in order to calculate the linear regression equations, we used data from 20 meteorological stations. The stations were divided into four groups, depending on the aspects (northern or southern slopes) and landforms (concave or convex) identified based on DEM and on knowledge acquired during fieldwork in the Tatra Mountains (Table 2). Depending on the decade, we selected between 4 and 5 stations located on the northern slopes, between 7 and 9 stations located on the southern slopes, 6 stations located in concave landforms, and 6 or 7 stations located in convex landforms. The altitude of the stations ranged from 465 to 2635 m a.s.l. Hess (1968) used stations located between 600 and 1600 m a.s.l. Some stations were rated according to both aspect and landform. Linear regressions between decadal air temperature and altitude depending on landform and aspect for the analysed decades are shown in Figs. 6 and 7. The regression equations describing the relationship between variables and coefficients of determination indicating the percentage of vertical changes in annual air temperature explained by altitude are included in Table 3. Table 3 also contains decadal mean annual air temperatures calculated from regression models for the arbitrarily selected altitudes of 1000 and 1500 m a.s.l. The model for concave forms was used for altitudes ≤ 1600 m a.s.l. In every decade, mean annual air temperature was higher on southern slopes than on northern slopes by an average of 0.9 K at 1000 and 0.8 K at 1500 m a.s.l. The difference in air temperature between N and S slopes increased in subsequent decades; for example, at the altitude of 1000 m, it rose from 0.6 K in 1951–1960 to 1.0 K in 2001–2010, while at 1500 m, it increased from 0.4 K in 1951–1960 to 0.9 K in 2001–2010. An increase in decadal air temperatures between 1951–1960 and 2001–2010 on northern slopes proceeded at a lesser rate (0.4 K at 1000 and 0.5 K at 1500 m) than on southern slopes (0.8 K at 1000 and 0.1 at 1500 m). The differences between concave and convex landforms were even greater than those between slopes of opposite aspect. The annual air temperature for concave landforms was higher on average by 0.7 K at 1000 and by 1.5 K at 1500 m a.s.l. These differences grew in the subsequent decades, particularly in the upper part of the mountains (at 1500 m), reaching 0.7 K in 1951–1960, 1.5 K in 1981–1990, 1.9 K in 1991–2001, and 1.9 K in 2001–2010. R2 coefficient of determination, T1000 m decadal air temperature at the altitude of 1000 m a.s.l., T1500 m decadal air temperature at the altitude of 1500 m a.s.l. This clear increase in the differences between the two kinds of landforms is due to various temporal tendencies in modelled decadal air temperatures (T1500 m, Table 3), increasing for convex but mainly decreasing for concave landforms. The only positive tendency for concave landforms occurred between 1991–2000 and 2001–2010. Coefficients of determination in most cases exceed 0.90 and, when the northern slopes are excluded, 0.97, which means that altitude explains more than 97% of changes in decadal air temperatures in the vertical profile of the Tatra Mountains. The smallest regressions were found for the northern slopes, where altitude explains from 88 to 94% of vertical changes in decadal air temperatures (Table 3). In order to validate the linear regression models, we first calculated mean decadal air temperatures for stations using the linear regression equations, followed by the differences between station and modelled data. Model accuracy was also assessed with MAE and RMSE, which are in common use. The resulting differences are included in Table 4; MAE and RMSE are presented in Table 5. The smallest errors are those for northern slopes and concave landforms, which means that the correlation between annual air temperature and altitude is the strongest for northern aspects and in topographic lows. The greatest errors, and thus the weakest correlations between air temperature and altitude, are found for convex landforms. The variability in single errors increases on northern slopes and concave landforms, as evidenced by the growing differences between MAE and RMSE (Table 4). Decadal air temperatures modelled for the dense set of points were used to assess the location and extent of vertical climatic belts for every decade. Individual climatic belts are delineated by the isotherms + 6, + 4, + 2, 0, and − 2 °C (Hess 1965). The distribution of vertical climatic belts in the earliest (1951–1960) and in the latest (2001–2010) of the analysed decades is shown in Fig. 8. Detailed information on changes in the extent of particular climatic belts in subsequent decades is presented in Table 6, which includes the planar areas of each belt in both square kilometres and percentages. The location and extent of the belts have clearly changed over the decades. These changes are sensitive to changes in average decadal air temperature, and thus not uniform within the vertical profile of the Tatra Mountains. The lowest part of the research area, with decadal air temperatures higher than + 6 °C, expanded substantially throughout the period, until finally, in 2001–2010, its area was more than 17% greater than in 1951–1960. As a result, the extent of the moderately cool belt was significantly reduced in the southern part of the area. In fact, each of the belts with decadal air temperatures < + 4 °C was smaller than it had been in the previous decade. However, the differences in the extent of climatic belts between the relatively cool decade of 1981–1990 and the two adjoining decades of 1951–1960 and 1991–2001 vary between positive and negative values for moderately cold, very cool, and moderately cool belts. A continuous and consequent decrease, albeit one occurring at different rates, was noted in the area of the cold and cool belts, with the exception occurring between 1981–1990 and 1991–2000 in the highest cold belt (Table 6). Over the past decade, the cold belt with air temperatures below − 2 °C virtually disappeared, as it covered barely noticeable areas (0.2 km2) located among the highest peaks of the High Tatra Mountains (> 2450 m a.s.l.). The area occupied by the moderately cold belt in 2001–2010 was also much smaller than in 1951–1960, particularly in the western Tatra Mountains (Fig. 8). It is also informative to express the areas of the belts during the past decade (2001–2010) as a percentage of their areas in the earliest decade. The area of the belt with annual air temperature > 6 °C in the last decade was more than three times greater than in 1951–1960, while the moderately cool and cool belts in 2001–2010 constituted about 83 and 80% of the corresponding areas in 1951–1960. The smallest decrease (by 10%) occurred in the very cool belt. Prominent changes took place above the isotherm of 0 °C, where, in the last decade, the moderately cold belt occupied 62% of its 1951–1960 area. However, the most dramatic changes concern the highest and smallest belt, which diminished by 94% over the past decade. Changes in any environmental conditions, including climate, can be observed first within boundary areas, which are transitional zones rather than lines; these areas are the most prone to changes. Thus, the response of the climatic belts to changes in air temperature is also clearly reflected in the temporal changes in altitudes of the borderline isotherms presented in Fig. 9 and quantified in Table 7. The mean, maximum, and minimum altitudes for the borderline isotherms, depending on aspect (northern and southern), are presented in Table 7. We used only those parts of slopes with aspects between 315°–360° and 0°–45° for northern slopes and between 135° and 225° for southern slopes. In the case of most isotherms, excluding the highest (− 2 °C), their altitudes on southern slopes were higher than on northern slopes. The minor differences in the location of the − 2 °C isotherm between S and N slopes are due to the secondary relevance of aspects at the highest elevations. The rate of changes varies depending on the isotherm. The most spectacular shift took place in the lowest part of the Tatra Mountains on southern slopes, where the + 6 °C isotherm moved up 163 m in terms of altitude between 1951–1960 and 2001–2010. This isotherm on N slopes lay far outside the research area and therefore could not be examined with respect to changes. The border between the moderately cool and cool (+ 4 °C) belts rose by 120 m on northern slopes and by 131 m on southern slopes. The relocation of the + 2 °C isotherm involved the shortest distances, which indicates that in the Tatra Mountains the smallest changes took place at altitudes of 1453–1531 m a.s.l. on N and 1517–1622 m a.s.l. on S slopes. The isotherm of 0 °C, which is the upper limit of the subalpine belt, changed altitude by + 105 on southern and by + 35 m a.s.l. on northern slopes, representing the greatest differences in the rate of changes depending on aspect. The boundary of the highest belt, with an annual air temperature below − 2 °C, was elevated by 109 m on N and by 214 m on S slopes (Fig. 9, Tables 7 and 8). Zonation, the most characteristic feature of mountain areas, concerns climate, as well as other climate-related features and processes, including the type and intensity of certain morphogenetic processes, rock weathering, soil types, rates of soil-forming processes, types of plant ecosystems, and associated faunal species (Balon 1991; Guzik and Skawiński 2009). The configuration of climatic vertical belts in the Tatra Mountains was determined using a manual approach at the end of the 1960s and beginning of the 70s (Hess 1966, 1974). In the present paper, using the relationships between annual air temperature and altitude discovered by Hess (1966, 1974), as well as the Geographical Information System, we examined temporal changes in the configuration of the vertical climatic belts. The issue is particularly important due to the significant increase in annual air temperature that, as we found, started in the Tatra Mountains in the early 1980s. The rate of warming was various and independent of altitude. The increases in annual air temperature at the Zakopane station, representing the foothills of the Tatra Mountains, and at Kasprowy Wierch, located at a high altitude, are similar, which may suggest uniformity in the warming rate in the vertical profile. Homogenous warming at all altitude ranges was also found in the French Northern Alps (Dumas 2013). However, the pattern of warming depends on the region. In upland areas of other Alpine regions, warming was sometimes more marked at higher altitudes (Bücher and Dessens 1991; Weber et al. 1997; Gobiet et al. 2014). Changes in air temperature in high mountain ecosystems is of utmost importance, because these ecosystems are controlled by low temperatures (Pauli et al. 2005) and are distinguished by strong altitudinal gradients (including air temperature) and minimal human impact (Graumlich 2000; Becker and Bugmann 2001; Graumlich et al. 2005). The combination of the relationship “altitude and annual air temperature” and GIS enabled us to model decadal air temperature for a dense set of points; this turned out to be very useful in the Tatra Mountains, where meteorological stations are scarce. Thus, changes in the distribution of the vertical climatic belts were identified using modelled data. As the data were modelled on the basis of station data, temporal changes in the modelled decadal air temperature refer strongly to the character of changes at the stations and probably do not incorporate some regional variations. On the other hand, the high correlation of annual air temperatures between stations (1981–2010) suggests that the identified shifts in the vertical climatic belts reflect general changes taking place in the Tatra Mountains. Our results indicate that decadal averages of annual air temperature reflect fluctuation inherent in climate data, something that can be seen clearly when subsequent decades are compared. For example, despite general warming, at some stations the decade 1991–2000 turned out to be colder than the previous decade, 1981–1990. Regardless of such fluctuations, we found clear shifts in the vertical climatic belts. In a comparison of the earliest and the latest decades, these shifts were enhanced on southern slopes in comparison with northern slopes. Importantly, in the past decade (2001–2010), the highest cold belt virtually disappeared. However, this effect may not be permanent. The cold belt may expand in future, provided that decadal air temperature decreases. Nonetheless, climate modelling studies predict future warming (IPCC 2013); therefore, changes in the locations and extents of the vertical climatic belts may continue in the future; if so, they will probably affect climate-related features of the environment. A complete disappearance of the very cool belt in the Karkonosze Mountains (Poland) caused by an increase in the air temperature of 1 K was predicted by Migała (2005). Kożuchowski (1996) estimated that an increase of 4–5 K in annual air temperature and of 2 K in the air temperature of the warmest month would cause an upward shift of about 300 to 360 m in the locations of the vertical climatic belts in the Tatra Mountains. The rate of shifts measured by Kożuchowski (1996) above the 0 °C isotherm is greater than that in the lower parts of the Tatra Mountains; this finding is in agreement with our calculations. According to the European Environment Agency (EEA 2009), the observed and projected impacts of climate change on mountain environments include uphill distribution shifts on the part of many European plant species; 60% of mountain plant species may face extinction by 2100. The loss of the coldest climatic zones on mountain peaks, general upslope shifts of vegetation belts, and loss of biodiversity are the effects of climate impacts mentioned most often (e.g. Puhe and Urlich 2001; Gottfried et al. 2002; Beniston 2006; Spehn and Körner 2005). It has been predicted that for each 1 K of warming, vertical climatic belts may be shifted upward by 150 m or more (Grace 1989). Climate impact research conducted in selected Alpine environments showed that mountain plants migrated upward during the twentieth century due to increases in air temperature (Grabherr et al. 1994, 1995, 2001; Pauli et al. 1996, 2001, 2005). In the subalpine turfless zones of the Sudetens and the Alps, an increase in the biodiversity of vascular plants was accompanied by a reduction in the number of endemic and rare species (Wojtuń et al. 1995). Moreover, Huntley (1991) suggested that three responses are possible at species level: genetic adaptations, biological invasions through species inter-comparison, and species extinction. Progressive replacement of currently dominant species by more thermophilous species (Grabherr et al. 1994; Keller et al. 2000) and declines in extreme high-altitude species at their lower range margins have already been observed in the European Alps (Gottfried et al. 2002, 2012). The response of ecosystems in mountain regions is expected to be the most significant at ecolines or ecotones. The most visible ecological boundary is the timberline. However, the relocation of timberlines as an effect of climate change will not be rapid due to their longevity and may even take centuries (Ives and Hansen-Bristow 1983). Another problem is human-induced changes (e.g. pastoral activity, felling) at timberline altitudes, which may mask potential changes resulting from climate change. In the Tatra Mountains, ca 33% of the length of the timberline is located at its natural altitude (between 1264 and 1650 m a.s.l.) while ca 67% has been artificially lowered—in extreme cases, by as much as 140 m (Fabijanowski 1962). On the other hand, due to the abovementioned land-use changes, large-scale relocation processes are probable over the next decades even in stable climatic conditions (Tinner and Ammann 2005). For example in Poland, at Babia Góra (1750 m a.s.l., Beskid Żywiecki), about 1/3 of the length of the timberline has been elevated over the past 45 years, mostly due to the cessation of anthropopression in the 1920s and 1930s. However, two overlapping factors were found to cause this effect: reduced human pressure and present climate changes (Czajka and Kaczka 2014). According to Bugmann and Pfister (2000), the areas between the morphological and climatic timberlines are the most sensitive to climate change. Animals will probably respond to climate change much faster than plants, as a result of their mobility, ability to adapt, and shorter life cycles (Ozenda and Borel 1990; Puhe and Urlich 2001). To date, no research on plant response to climate change has been conducted in the Tatra Mountains. Although every mountain range is unique, the potential consequences of changes in vertical climatic belts might be analogous to those in other mountains, particularly in central Europe. Using the relationships between altitude and decadal air temperature as well as Geographical Information Systems, we analysed temporal changes in the extent and location of vertical climatic zones in the Tatra Mountains, where meteorological stations are scarce. Four decades representing various phases of climate change were compared (1951–1960, 1981–1990, 1991–2000, and 2001–2010). The earliest decade (1951–1960) represents a period of stable climate conditions, whereas the latest (2001–2010) covers a period of rapid increase in air temperature. 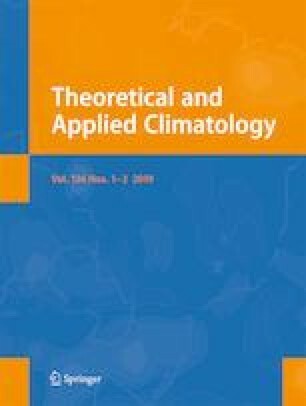 Data from 20 meteorological stations were used to calculate regression equations describing the dependence of decadal air temperature on altitude separately for northern and southern slopes and for convex and concave landforms. Trends in annual air temperature in 1951–2016 at the Zakopane and Kasprowy Wierch stations were also discussed as a background for further analysis. A significant increase in annual air temperature at a rate of 0.5 K per decade started in the Tatra Mountains at the beginning of the 1980s. Both the spatial extents and locations of the vertical climatic belts have changed over the research period; however, these changes have not been uniform. The most significant shifts have taken place at the lowest and at the highest altitudes. The area of the lowest belt has expanded, while the area of the vertical climatic belts above the snow line has diminished considerably. The smallest changes in area have been those affecting the very cool belt. The cold climatic belt, delineated by annual air temperatures lower than − 2 °C, virtually disappeared during the research period. In the past decade, the cold climate belt occupied small areas on the highest peaks of the High Tatra Mountains. The uphill shift of the vertical climatic zones on southern slopes was greater than on northern slopes. We thank Tadeusz Niedźwiedź for his supportive comments on the manuscript. We express our special thanks to Pavel Šťastnỳ from the Slovak Hydrometeorological Institute for providing metadata on Slovak meteorological stations. Supportive comments by an anonymous reviewer are also appreciated.